Cakey won't stop talking about Santa. 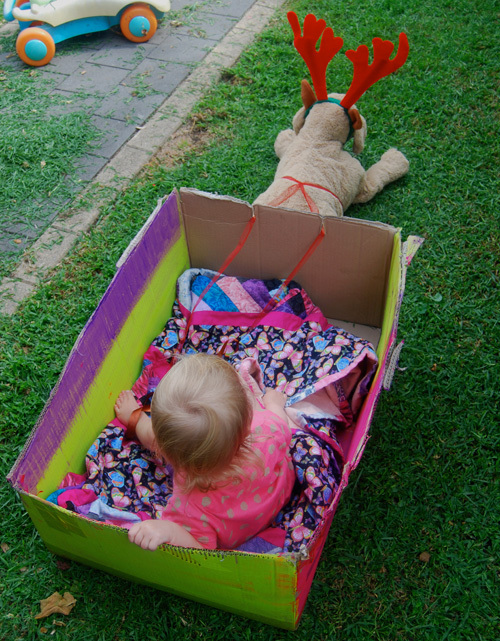 Santa has now made an appearance in her imaginary play and she wanted to turn a large box left over from Christmas into his sleigh. 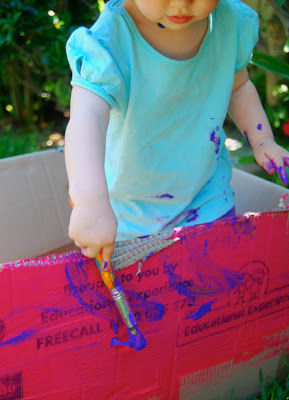 We painted the box pink, purple and yellow because she refuses to toe the line about the traditional red and green Christmas colours (check out When Christmas craft goes wrong). Once dry, I found the largest toy animal in the house and tied a ribbon around him to make the reins. Cakey added the deer antler headband to turn our toy dog 'Dingo' into a reindeer. I cut two vertical slits in the cardboard box to hold the ribbon in place. Lots of fun was had riding around in the sleigh delivering presents. Cakey was a little disappointed that she had to make the sleigh move in her imagination only as I refused to pull them around the yard. 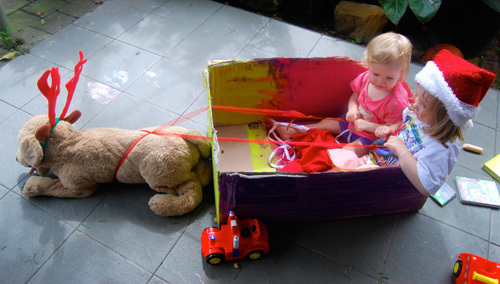 You did a great job with what must have been an improvised craft - looks like a lot of fun! Love this creative imaginary play! Fantastic idea. Thanks Bronwyn and Susan, it has now turned into a car. I love the imaginations of kids!! Brilliant Santa sleigh. I love all of yours and Cakey's fantastic ideas.